I first came across the work of Leah from Juan is Dead during the summer when I wrote a piece for the Metro UK about how super fashionable everything Mexican is right now in Britain. I absolutely love her work for its fun, cheeky playfulness mixed with real talented craftsmanship. 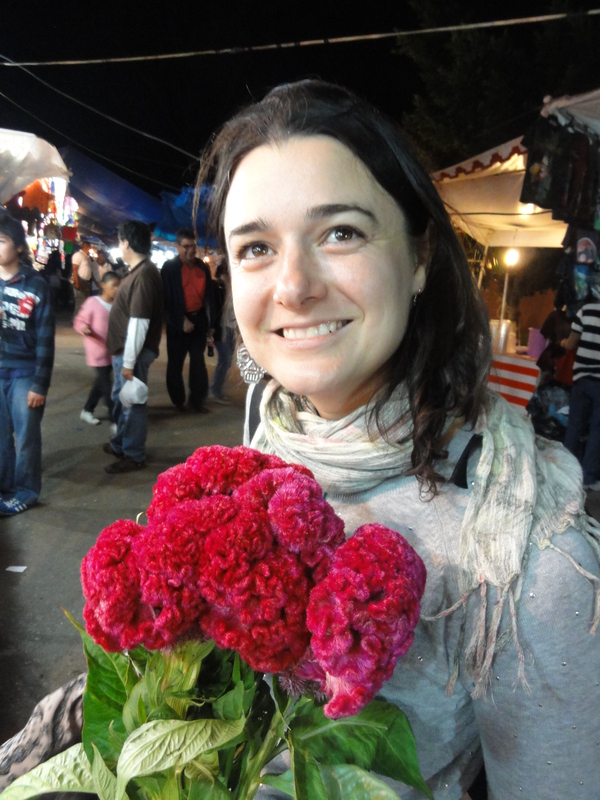 Leah’s experience of Day of the Dead in Oaxaca, told below, beautifully captures the appeal that Day of the Dead holds for so many foreigners. Enjoy! And don’t forget to check out her fantastic work! 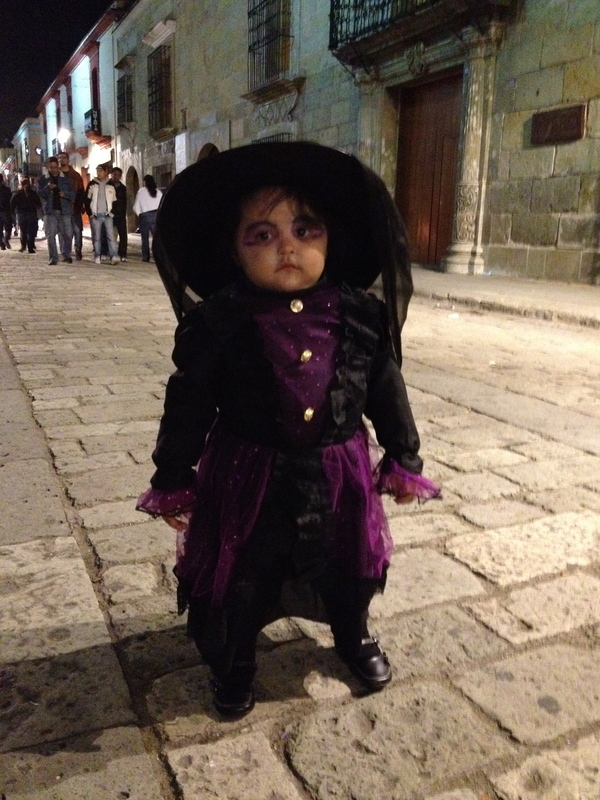 In the days leading up to Dia De Los Muertos I walk the paved streets of Oaxaca. 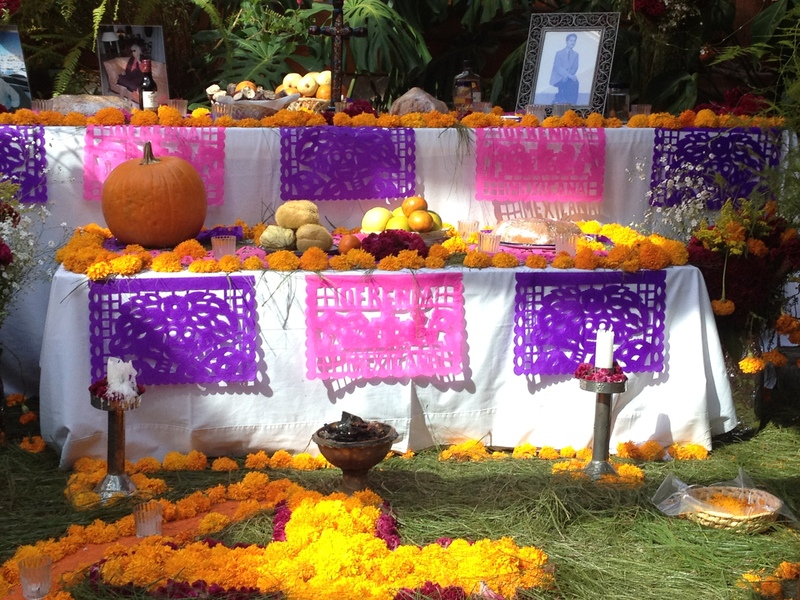 Every home, shop, restaurant, bar or hotel has an altar; a table or corner colourfully decorated with skeleton figurines, the bright orange flowers ‘Cempasuchil’, plates of food and photos of loved ones. Shops are crammed full with tin skeletons and ceramic sugar candy skulls. Life size paper mache skeletons sit at a table in a café as though sharing a coffee and a gossip. Colourful cut out skeleton ‘Papel Picado’ line the streets. 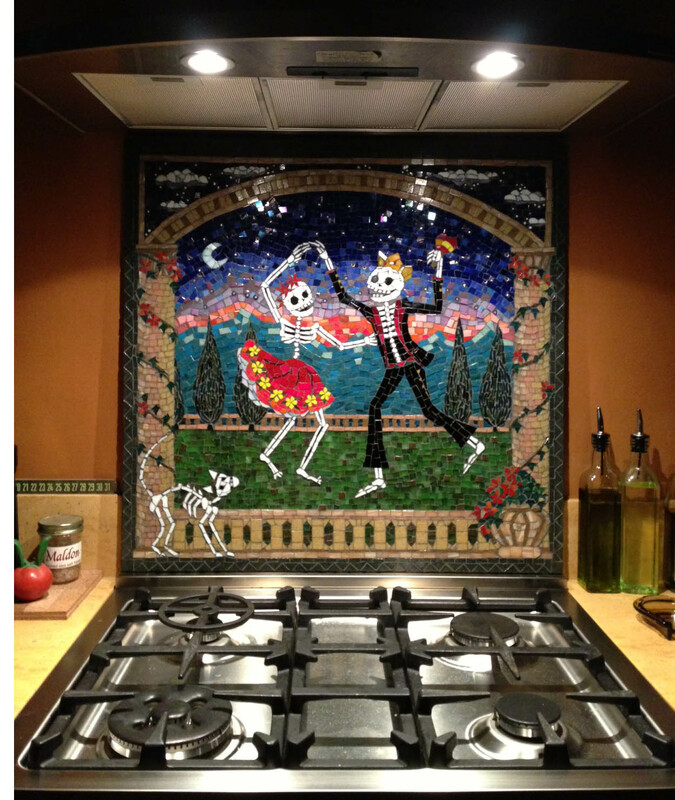 I live in London and for a living I make skeleton mosaics. Most of the time I get a great response, but sometimes people shudder when they walk past my stall or ask why I’m obsessed with death? Funnily enough I never thought I was, I certainly hadn’t set out to be controversial. I just like skeletons. Here in Oaxaca, surrounded by all the colourful arts and crafts, I feel right at home. The niggling questions about my subject matter dispersed. For once, it all makes wonderful sense. 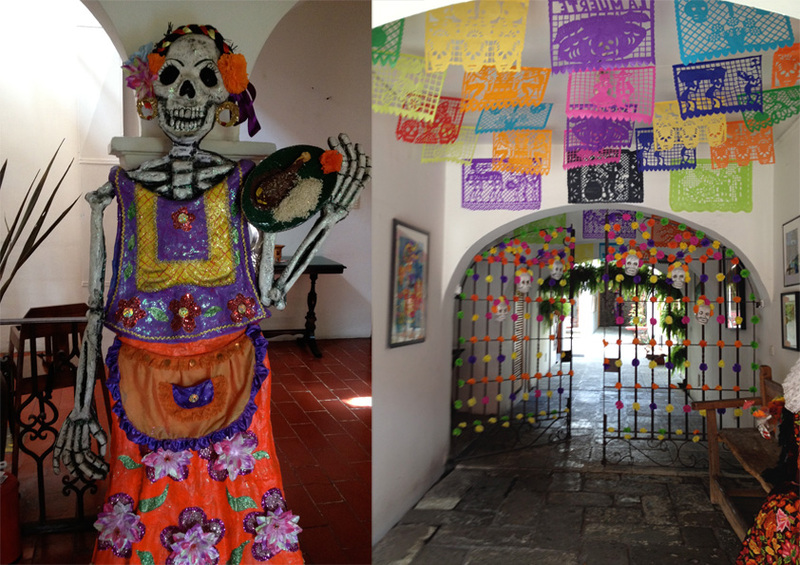 Dia De Los Muertos is 2 days where the dead come back to visit and party with the living. You never really have to say goodbye to your loved ones, as you will be with them every year at this special time. 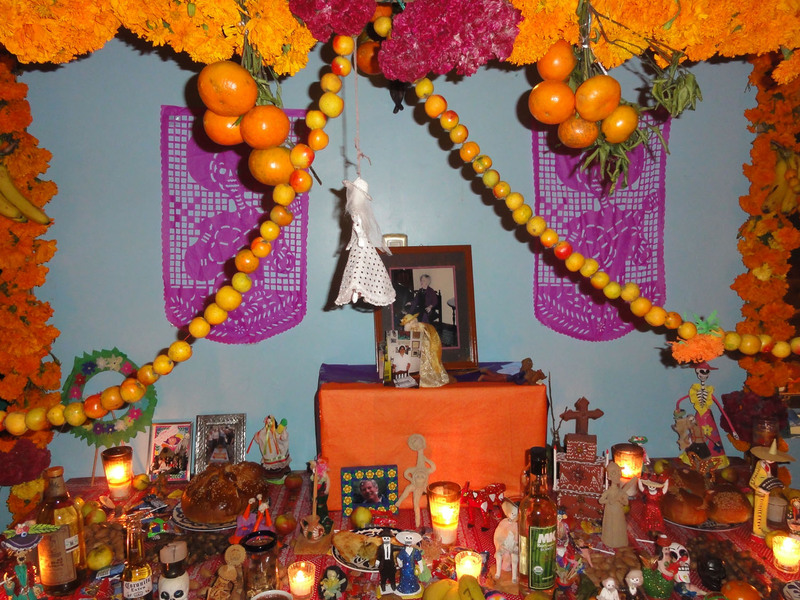 The altar becomes central to the home and represents the passageway between the dead and the living. I like the way the altar becomes a work of art in itself. When you have a drink or a meal, a portion is also placed on the table to share with the dead. If a loved one smoked you might place a box of cigarettes on there, or if they liked painting or dancing you might add a skeleton figurine enjoying this past time. 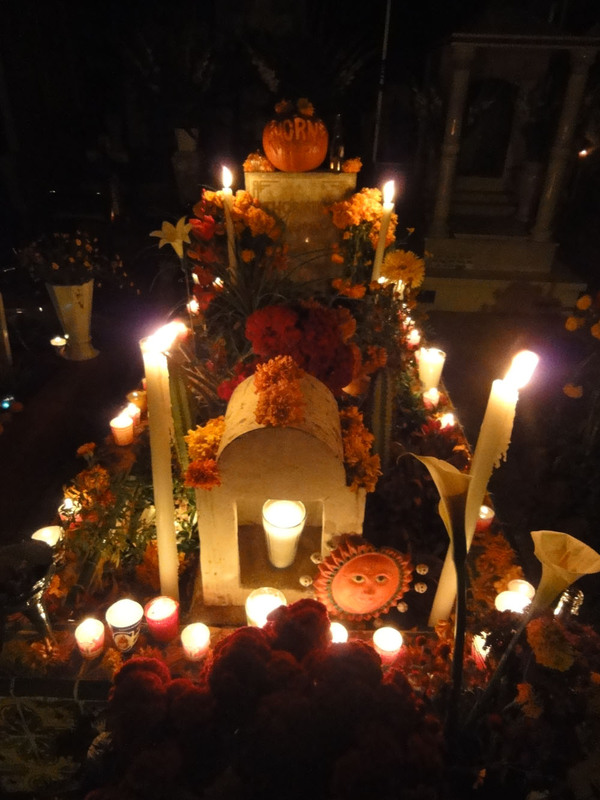 While in Oaxaca I was lucky enough to be invited to our Hotelier’s celebration at the local graveyard. Her husband had died a few years before and now every year she has a party there with all her family, friends and guests. When we arrive the graveyard is alight, each gravestone highly decorated with candles, bright orange and purple flowers, groups of families and friends huddle around, taking vigil, chatting and laughing into the night. Some even hire Mariachi bands. At first it did seem a little odd and I couldn’t quite shake off the ingrained idea of being quiet as a mark of respect in a graveyard. But actually it didn’t take long (perhaps only a shot of Mescal long) to relax and enjoy the atmosphere. It was a warm and magical night and we were welcomed into the celebrations. 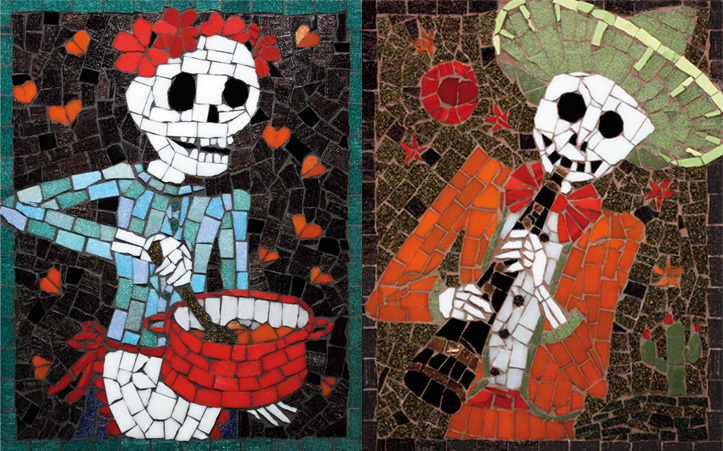 Juan is Dead is the vision of artist Leah Reeves who’s love of mischief and other-worldliness inspired her to use her mosaic skills to create contemporary one-off pieces of art and illustrations based on the Mexican celebration Day of the Dead. Leah’s work is influenced by her Spanish ancestry and along with her passion for Mexican art has imagined the family of characters in Juan is Dead enjoying the afterlife and having ‘one hell of a party’. Their world is without worldly worries such as money, work or hangovers. Here you will find candy skulls, skeleton musicians, dancers and cool cowboys all hanging out at the bar, living life to the full. Wonderful post! I love how it talks about the lighthearted spirit with the relationship of Mexicans and death. It makes me a bit nostalgic and wish to be home enjoying pan de muerto. I really love that commissioned piece of the couple and their cat! I can see how the art subject would come off as strange at a glance in a foreign country. I love your work Leah, I wish I could spare the money right now to buy the colored his and hers mugs, I know the perfect couple right now that I would love to gift them these mugs. Great comments Mani…I totally agree! How wonderful would it be to have the mugs to serve tea to guests! Hi Mani, Thank you for you nice comments and I’m glad you enjoyed the read! I’ve just had a look at your blog- What an amazing journey, I look forward to having a good look when I have more time! All the best. I’ll be there this year for the day of the dead. Thanks for sharing this interesting post. That’s wonderful. I am sure you will enjoy it! Thanks for your comment!